I have an interesting book that outlines the steps involved in the tea ceremony… the manual details 331 steps! But actually you can partake of the tea ceremony in just six little steps: 1) heat water, 2) put tea leaves in a pot, 3) pour hot water in the pot, 4) pour tea in a cup, 5) offer the tea, 6) drink the tea. Or even just these three: make – share – drink! At the heart of the tea ritual is the practice of awareness and sharing, of being totally in that moment of tea-making, without thinking about other things that are going on in your life or what you have to do afterwards. Just making tea. And once the tea is prepared, offer a cup to your friend with a loving heart, or offer it to yourself with a loving heart! And when you sip the tea, as I mentioned before, ponder on the journey that the tea has taken to be here in this moment, in your cup, in your mouth. Taste the earth, taste the sunshine – doesn’t that warm your soul? Traditionally, tea ceremony is held in a small single-room hut, shut away from the mundane world in a peaceful garden, in which you can enjoy a cup of tea prepared carefully, mindfully, and lovingly by your host. The ritual involves the offering and receiving of tea, of sharing a moment, both persons experiencing this quiet moment together. Stillness, warmth, sharing a moment far from the madding crowds. How wonderful! The lengthy training required and the 331 steps described to create that experience is the Way of Tea: just as in learning any skill or a martial art or any kind of art, to excel and be able to smoothly and effortlessly prepare tea with an open heart in full awareness requires time and discipline. However, the essence of sharing a cup of tea is to just keep practicing being in the moment of tea-ness, every time you make a cup of tea. So, when you put tea in the pot, just put tea in the pot; when you pour in the water, just pour in the water…. you get the gist! It sounds so simple but how difficult this actually is! As soon as we are doing something repetitive our minds just seem to drift off to all kinds of other things that are happening around us. But if you can remember to just watch the movement of your hands as you prepare the tea, hear the water boiling, smell the delicate scent released by the leaves, then this process becomes a gentle meditation that is very restful and, like the traditional tea ceremony, casts away that stresses of everyday life. The Japanese Zen master, Soen Nakagawa, who was one of the first Zen teachers in America, is famous for making ‘tea ceremony’ using instant coffee and a styrofoam cup! He always taught his students that what mattered most is your pure intention and the importance of offering your heart with humble respect. 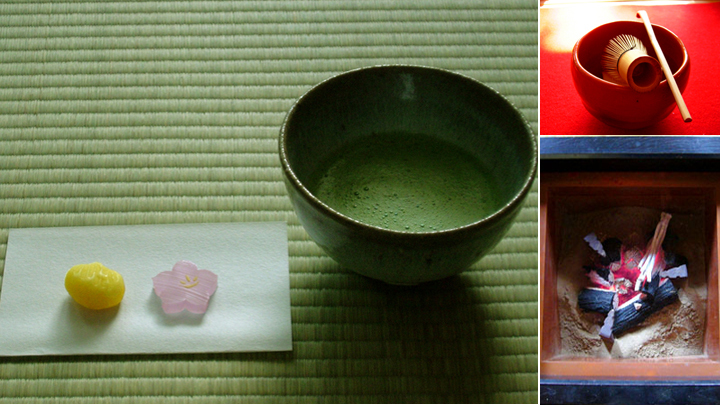 This entry was posted in Buddhism, Spirituality and tagged green tea, tea, tea ceremony. Bookmark the permalink. Thank you Cate for this timely reminder.It has become so simple to throw a tea bag into a cup and pour boiling water over it and then gulp it down, all while doing something else! A symptom of our fast and instant society. Your comments have reminded me how simple and important it is to be mindful of our everyday actions. Having a cuppa can be a beautiful way to add more ritual into our daily lives. No more tea bags for me! Thanks Janet for your comment – I too get caught up in grabbing a cuppa on the run and I agree that this a great way to participate more in the much-needed rituals of daily life. But don’t be too hasty in throwing out the teabags! As I mentioned, Zen master Nakagawa performed tea ceremony with instant coffee and disposable cups as a way of reminding us that it is not the ingredients that create the ritual, but rather our intention and mindfulness at the moment of participating in the ritual of tea. So we can bring into our daily spiritual practice the challenge of finding that precious moment of “Ah!” in the act of jiggling a teabag and then enjoying the first sip… then rush out the door to work! Then set aside some special quiet time to create a good cup of green tea, watching the delicate green leaves slowly unfold, savouring the aroma, and sitting in the garden to enjoy the bitter-sweet taste of the tea. That becomes a luxurious “Ahhhhhhh…..” moment instead! I love chai too Deborah! When you feel like you’ve reached your ‘perfect’ chai, please share the recipe with me. I have found that peppercorns are a great ingredients – whole, not crushed. I also enjoy collecting teapots, especially when they have some connection to a special place or person – your op-shop find sounds wonderful – I wonder who made tea in it? And who shared it with them? I promise to share! Thanks for the tip about whole peppercorns..the mix I’m using at the moment has ground black pepper as its first ingredient and I’m finding it overpowering. Hence, the quest for the perfect recipe continues! I would love to know the provenance of my chai teapot as well. It really is beautiful. If I can get my act together, I shall send a photo to you!